Cycle 6: The Pre-Fast Preparation Begins Today!!! This Cycle we are pleased to continue our Connector Group Leader Initiative. A Connector Group Leader extends an invitation to those in his/her social network to fast with him/her. We are excited to announce that 30 Connector Groups have been formed for Cycle 6! The groups range from 3 on up; no group is too small or too large. In fact, we are praying for at least 1000 Surrender Fasters for Cycle 6 so your efforts are helping to make this vision a reality. If you would like to start a Connector Group please REGISTER online. Morning Prayer resumes Sept. 16, 7am (ET), M-Th. Theme for the calls: Filled to the Full. Don’t forget to pass the word through email and/or share this blog on Twitter and Facebook. Thanks! I ready for this fast. I can’t wait to see what God is going to do this time. This is my 2nd surrender fast. I’m excited about this one. I know so much now. I really felt connected and my life changed during the first. This time I’m attempting to change my focus as a fast. To surrender to constantly looking at social media to feel connected. Welcome back Betts! Sounds like you already know what you are surrendering. I am excited about what God will do during your time of surrender! Looking forward doing this again from Afghanistan. Sidney great to hear from you!!! Welcome back to the Surrender Fast. I know that God is going to show up in amazing ways for you. 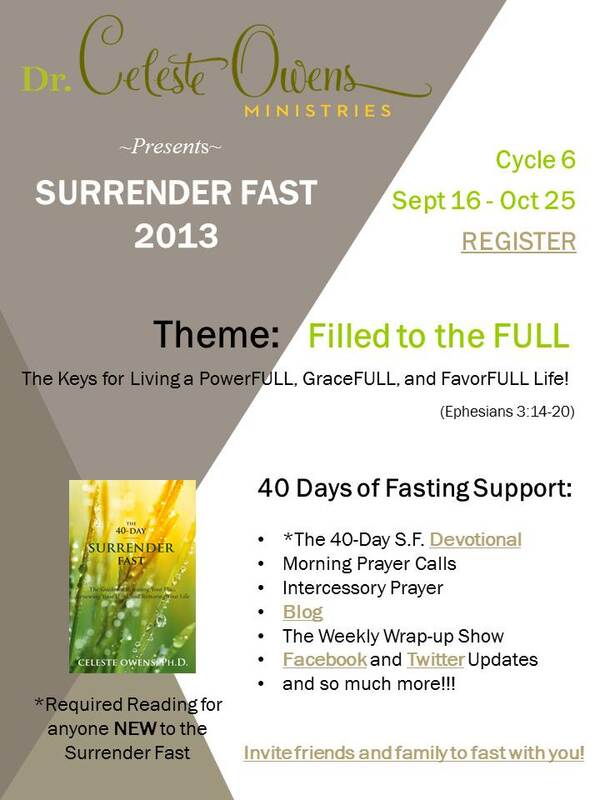 Please let us know how we can prayer for you by sending your prayer request to prayer@surrenderfast.com. Be blessed!